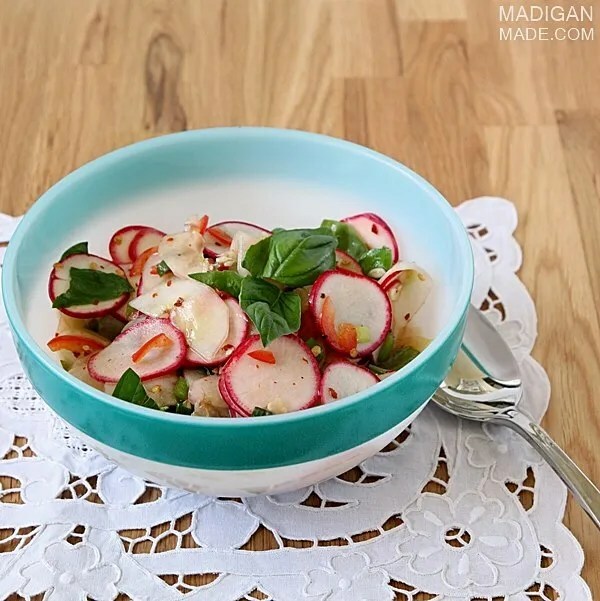 Madigan made… an easy salad of cucumber, radish and red pepper. Summertime is fresh veggie time, isn’t it? I love it! Are you enjoying this season’s fresh produce? I spied a bunch of local cucumbers at my grocery store this weekend and couldn’t resist picking up one. And then I saw a bunch of radishes and immediately grabbed those, too. I’ve already told you that cucumber and radishes make a great appetizer. But I needed a side dish for dinner and I wondered what else I could make with these two veggies. So I found this Thai salad recipe from Rachel Ray and tweaked it a little to accommodate the ingredients I had on hand. (i.e. regular radishes vs. Daikon) We love spicy food and I knew that the premise of this salad would appeal to both my hubby and me. Plus, it helped me use up more of the basil I have growing out on our deck. 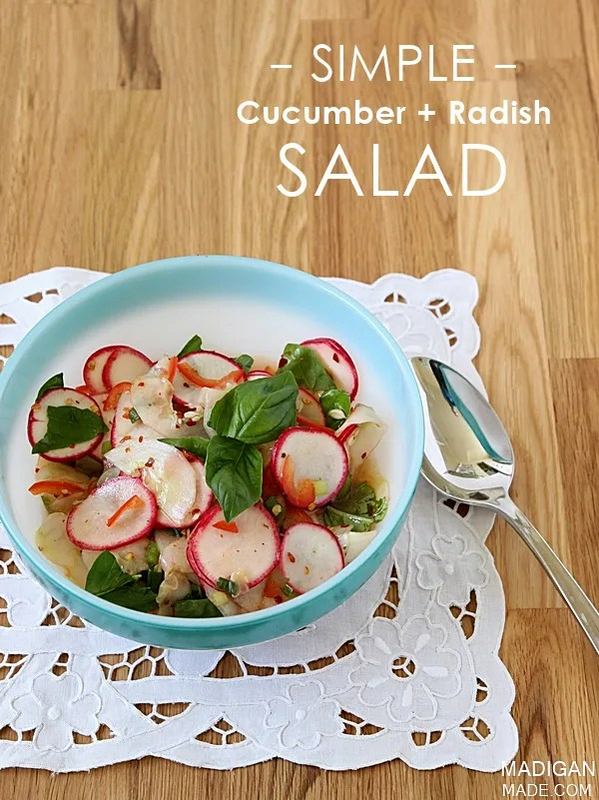 I loved the kick the radishes, red pepper and pepper flakes added to this salad… it was a refreshing update to the traditional cucumber salad that I’m used to eating. This salad was the perfect complement to our burgers last night. Yum! Very, very thinly slice up the cucumber, radishes and red pepper. I used my mandolin to do this. If you use a mandolin and are prone to accidents (like me! )… please be very, very careful!! That blade is sharp! Before you serve the salad, roughly tear the basil into the salad… toss and enjoy!